Slaughterhouse is a hip hop supergroup consisting of rappers Crooked I, Joe Budden, Joell Ortiz and Royce da 5'9". They are currently signed to Shady Records. 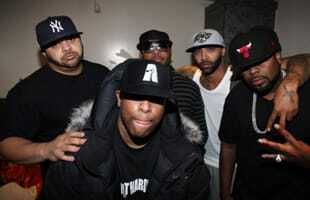 Slaughterhouse is a super group that doesn't get enough credit because lyrically they are all at the top of their game. Video: Chops The Pig Prank Calls Royce Da 5'9"
Video: Slaughterhouse ft. Swizz Beatz - "Throw It Away"
Video: Slaughterhouse f/ Swizz Beatz "Throw It Away"
Mixtape: Slaughterhouse - "On The House"
Mixtape: Slaughterhouse "On The House"